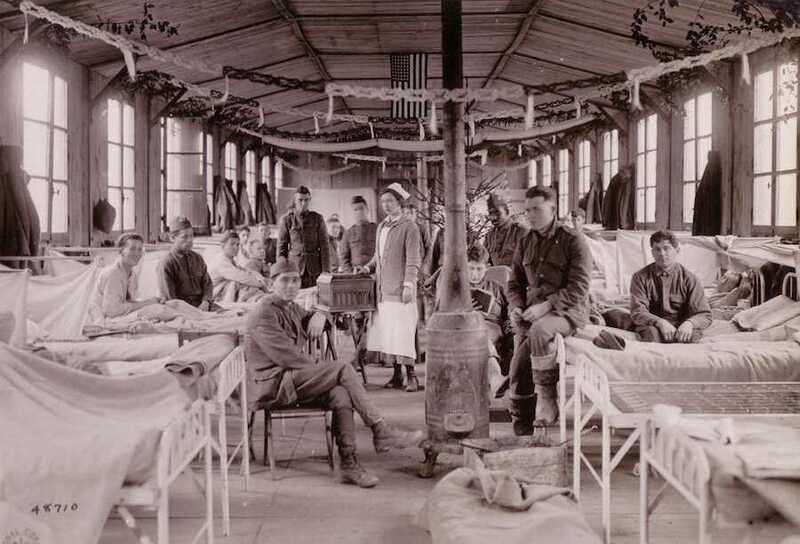 A festive ward at Camp Hospital №33, in Brest, Finistere, France, December 1918. Courtesy of the Army Medical Department Center of History and Heritage. As a German plane buzzed overhead, nurse Helen Dore Boylston dropped face down in the mud. Boylston, an American nurse serving at a British Army base hospital near the Western Front in 1918, had been running between wards of wounded patients that night, trying to calm their nerves during the air raid. Now, all she could do was brace herself for the hissing bomb that hurtled toward her. She covered her eyes and ears against the deafening roar and “blood red flare.” About a half hour later, finally realizing she had not been hurt, Boylston stopped shaking. Boylston’s vivid account of her World War I nursing experience, published in 1927, depicts her work with the first Harvard Unit, a U.S. medical team that treated more casualties than any other group of American doctors and nurses during the conflict. 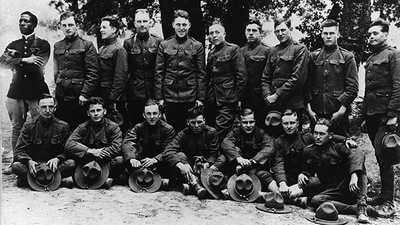 In May 1917, U.S. medical teams became the first American troops to arrive in the war zone, and many remained through mid-1919. Over 22,000 professionally-trained female nurses were recruited by the American Red Cross to serve in the U.S. Army between 1917 and 1919 — and over 10,000 of these served near the Western Front. More than 1,500 nurses served in the U.S. Navy during this period, and several hundred worked for the American Red Cross. Additionally, a handful, like Boylston, worked in American units of the British and French armies. The U.S. military rejected for overseas service nurses who were African Americans or immigrants, despite drafting men from these groups. Although Allied military leaders wanted to keep the (female) nurses far from danger, they soon realized that many more combatants’ lives could be saved if wounds were first treated near the front rather than at far-away base hospitals. Numerous nurses served at front-line casualty clearing stations or with forward units. In August 1917, U.S. Army nurse Beatrice MacDonald, on duty at a casualty clearing station, came under enemy fire during an air raid, and fragments of shrapnel from a bomb blast sliced through her eye. After being evacuated, MacDonald refused orders to go home, reportedly stating, “I have just started doing my bit.” With only one eye, MacDonald remained on duty in France until after the armistice, and was awarded the Distinguished Service Cross. War nursing’s more common hazards included infected fingers, sickness, and physical strain. “My back is busted in two tonight. Slowly, [moving] down the ward, doing the dressings and making the beds,” Boylston wrote in her diary. This frequent changing of dressings and application of antiseptic, though physically exhausting, served a critical medical function in the pre-antibiotic era: It became the most effective method for healing infected war wounds and prevented many limb amputations. 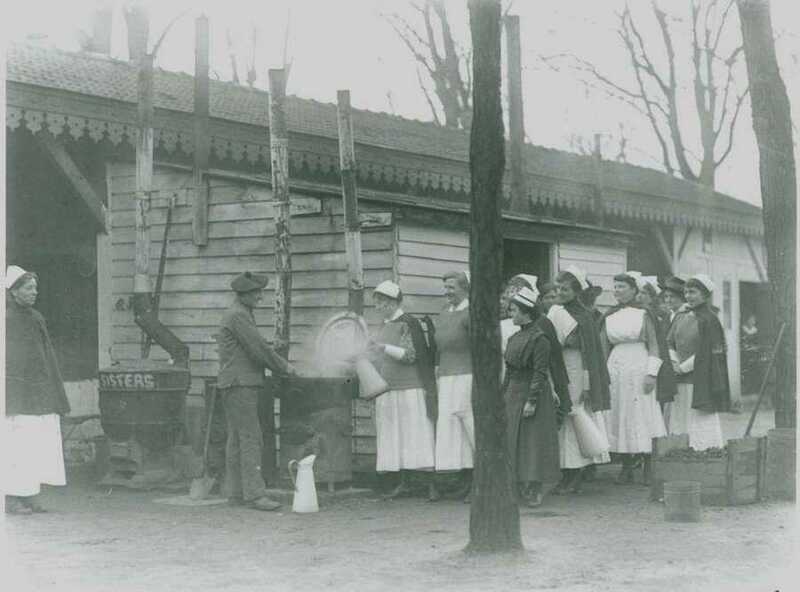 Nurses in line for water at Base Hospital №21, in Rouen, France. Courtesy of the Army Medical Department Center of History and Heritage. In her diary, Boylston also described the social side of war — how ever-present reminders of mortality and the transience of military life lent special intensity to otherwise ordinary human relationships. For nurses, close friendships became indispensable, while romances served as welcome distractions or led to engagements. But Boylston differed in some respects from most U.S. military nurses. She was 23, and came from an affluent family, while many U.S. Army and Navy nurses had working-class or rural origins. Laura Huckleberry, who served in Base Hospital №12, the “Northwestern Unit,” more typically exemplifies these nurses. In 1909, she left the Indiana farm where she grew up to study at the Illinois Training School for Nurses in Chicago. 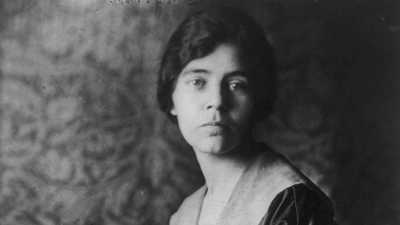 After graduating in 1913, Huckleberry worked as a public health nurse investigating contagious diseases in the city’s immigrant neighborhoods. When Huckleberry’s unit sailed to France to take over a British hospital at Dannes-Camiers, she was 29 and already dating the man she would marry, John Erle Davis. 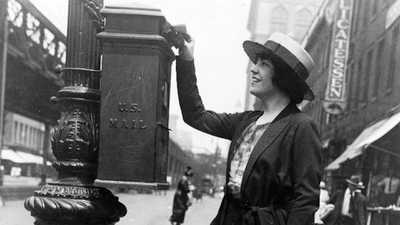 During her time at war, Huckleberry wrote over 150 letters to Davis, who was also stationed in France. Some nursing leaders agreed. A campaign to accord the U.S. military nurses rank, which coincided with the Woman’s suffrage movement, led in 1920 to a compromise in which U.S. Army and Navy nurses were accorded “relative ranks” of Lieutenant, Captain, and Major. Actual commissions would have to wait until 1947. But the battle for these original commissions is not over. Huckleberry and Davis’s youngest son, Michael W. R. Davis, who has woven his parents’ letters together with diary entries from others in a forthcoming book — has launched a campaign to get the U.S. Army and Navy to posthumously commission his mother and the other World War I U.S. nurses. This act, Davis believes, would be a fitting way to honor these pioneering and largely unappreciated women veterans on the centennial of the war. 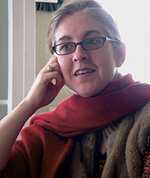 Marian Moser Jones is a historian and Assistant Professor of Family Science at the University of Maryland School of Public Health. She is the author of The American Red Cross, from Clara Barton to the New Deal (Johns Hopkins University Press, 2012). How the first black combat pilot escaped America, became a hero in France, and ended up an elevator operator in New York. #WarLetterWednesday, a weekly social media challenge to showcase stories of wartime correspondence.